Southview Guest House Guest HouseThe Southview is a licensed guest house with 10 ensuite bedrooms comprising of 5 superior rooms with ensuite spa baths or body jet showers and a fabulous contemporary king-sized 4-poster room, along with 4 smaller classic ensuite bedrooms. We are situated in a quiet cul-de-sac location within 2 minutes walk of the bars/restaurants and shops of Windermere village centre. There is an honesty bar in the resident's lounge offering a selection of beers, wines, and soft drinks in an informal and relaxed atmosphere (open till 10:30pm). Wireless internet access is available in all bedrooms. 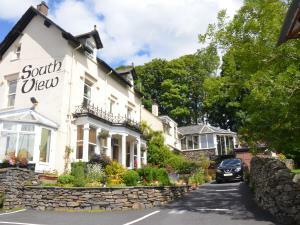 Southview Guest House sometimes limits bookings to 2 or more days. Extensively refurbished comfortable double bedded accommodation with full ensuite, shower, washbasin and WC. Flat screen TV, complimentary tea and coffee, radio alarm clock, hairdryer and toiletries. Classic Double sometimes limits bookings to 3 or more days. Comfortable twin-bedded accommodation (can also be a Super King Double on request) with full en suite shower, washbasin and WC. Colour TV, complimentary tea/coffee facilities, radio alarm clock, hairdryer and toiletries. Classic Twin sometimes limits bookings to 3 or more days. Contemporary 4-poster, king-size, room with en suite shower, with body jets, WC and washbasin. This large room benefits from full-size TV, DVD player, alarm radio, hairdryer and toiletries. King-size 4-pos sometimes limits bookings to 2 or more days. High quality furnishings, fabrics and furniture in this larger room. Full en suite spa bath with shower over, WC and full-size basin. Full size TV & DVD, radio alarm, hairdryer. Superior Double sometimes limits bookings to 2 or more days. Leave M6 jct 36 and follow A590/A591 to Windermere. At the Windermere Hotel, turn left into the town centre, pass the Tourist Information Office and Cross Street is 2nd on the left. South View's car park is at the very end. Weekend was book for a birthday gateway. Lovely and clean guest house and great breakfast.